Courageous Christians United - Blog - Should a Christian Vote for Mitt Romney? Mitt Romney is running for the presidency of the United States this year. Problem: he's a Mormon, and there will always be a certain percentage of people will never vote for a Mormon. In 2008, 53% of Evangelicals said they would not vote for a Mormon. The Bible says nothing concerning whether a Christian should vote for someone who is not of the same faith. Wisdom though would seem to suggest that Christians should vote for someone who will best attempt to support their values in exhibiting Christ in this world. Martin Luther is typically taken to have said that he'd rather be governed by a competent Turk (a Muslim) than an incompetent Christian. With that said, there is no reason why a Christian cannot vote for Romney under certain circumstances. Would you vote for Romney under any of these circumstances or is there no circumstance in which you would vote for him? And if you are a republican Christian, would his religion bar you from voting from him even if you believe, out of all the other candidates, his values best represent your own? Isn't it obvious that voters are simply looking for someone who best represents them in as many areas as possible? Religion happens to be a big part of the lives of Evangelicals. So of course Christians would love to have someone running who is a well-respected and experienced--both politically and spiritually-- Christian. But if that is not an option, then what? Do Christians give up on influencing the country in this one area? From a religious standpoint, what interests me here more than anything is that the reservations Evangelicals have in supporting Romney are indicative of the sociological fact that Evangelicals do not consider Mormons to be really like them. They are in fact quite different. So if Evangelicals want someone who best represents them, then why not vote for a third-party candidate who actually does? The problem is that everyone knows, even those who vote for third-party candidates, that, at least in the 2012 election, either Obama or Romney will be our next president. Given what we all know, it seems obvious that voting for a third-party candidate is a complete waste of time, and that doesn't seem to be honoring the Lord. This is especially true in a swing state. And again, Evangelicals seriously need to ask themselves if these third-party candidates, even if they are fellow Evangelicals, are really more competent than Obama or Romney. Just because I would hold to all the positions fellow Evangelicals care about doesn't entail that anyone should vote for me. I would make a lousy president of the United States. Are there religious reasons why an Evangelical may have a difficult time trusting Romney to be a good leader? 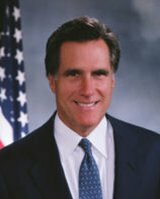 On June 5, 2006, Romney appeared on The Charlie Rose Show, and told Judy Woodruff that the strangest thing he believed in as a Mormon was the Noah's ark story (to see this interview, click HERE). It is beyond belief that a smart life-long LDS guy like Romney actually believes this. He knows very well that the rest of the world doesn't wear LDS underwear, for example. He knows very well that the rest of the world doesn't hold to baptism for the dead. He knows very well that the rest of the world doesn't hold that God had to get a wife before he could become a god. The list goes on and on. It appears to me that Romney threw this out for unsuspecting fundamentalist Christians in order to gain their sympathy. It is a classic example of how LDS practice "lying for the Lord." Another area of concern is racism. Of course the LDS Church allowed black men to have the priesthood just 30 years ago, but the concern is still Romney's more basic beliefs concerning black people. Does Romney still hold that blacks received a curse of their dark skin because they did something bad in some supposed pre-earth life? Most LDS still hold to this doctrine that has been taught by their own prophets and apostles (e.g., Joseph Fielding Smith, "Doctrines of Salvation," 1:61-7 and Bruce R. McConkie, "Mormon Doctrine," 527-8). Further, Romney's own scripture is clearly racist. The Book of Mormon teaches that God cursed some with dark skin and as they repented their skin became white (2 Nephi 5:21-4, Alma 3:6-9, and 3 Ne. 2:14-6). Just as one would naturally have reservations with Muslim attitudes toward Jews given the former's history and scripture, one would at least also have some reservations regarding what Romney's attitudes really are. One last area many are concerned with is Romney's temple vow of consecration. The temple ceremony states, "It is that you do consecrate yourselves, your time, talents, and everything with which the Lord has blessed you, or with which he may bless you, to the Church of Jesus Christ of Latter-day Saints, for the building up of the Kingdom of God on the earth and for the establishment of Zion." Would such a vow ever conflict with Romney's sworn duty to uphold the constitution of the United States? If the founder of Mormonism, Joseph Smith, who also ran for president of the United States, could trample on freedom of the press and order the destruction of the Nauvoo Expositor all for the preservation of the Mormon Church, then is it really that hard to think Romney could do the same thing on some occasion... especially if so ordered by the current LDS President? Having discussed some issues of trust for Romney, keep in mind trust applies to everyone. For all those thinking only one candidate is evil, or lacking trust, or for all those worried about voting for the lesser evil, may I remind you that any vote is for someone who is evil. We are all sinners (Rom. 3:23) in need of God's grace. Given that's the case, it seems the Christian's job is to support the candidate he or she thinks is, or will bring about, the greater good. Could Romney really be the greater good if more people will be deceived and join the cult of Mormonism? This is always possible, but it seems to me that the more people seriously investigate Mormonism, the more leave it or are repelled by it (e.g., see the following statement by a Mormon General Authority). The internet and the age of information we live in are having a devastating effect on the LDS Church. If that's true, then one could make an argument that electing Romney will only bring more attention to Mormonism, and more people staying away from it. This entails that joining Mormonism because some president of the United States may be Mormon is going to be a really lame excuse come judgment day. Unbelievers, as well as Christians, are deceived every day by various points of view. That's why we evangelize the lost and give them good reasons for the Christian faith; all the while trusting God to bring those who are His elect to Himself. We don't manipulate or even kill, so that others will not be deceived. We do what we think is best, and allow individuals the respect to make up their own minds. Further, a case could be made that more have been deceived by Obama's liberation theology as well. If both candidates promote a false gospel, then again, one ought to go with the lesser evil or greater good. If there is an opportunity to bring more goodness into our nation by electing a particular unbeliever over even an incompetent Christian, then caring individuals will vote for who they think will best bring this about. The gospel must be preached, but it is also lived out. It extends grace out to a troubled world in all areas of life. As a result, a believer should vote for the one who wants to save more lives--with new birth from above when that's possible, and when it's not, then with measures to prevent the unjust loss of life (e.g., abortion, infanticide, active euthanasia, needless wars, etc.). Secondarily, the believer ought to vote for the one who will bless others in making their lives qualitatively better. (It should be obvious why this is "secondarily"--if there are no lives, then there is no life to bless.) The believer is commanded to do whatever (including voting) for God's glory (1 Cor. 10:31). If that is the intent come voting day, then the believer will not be intending more people becoming deceived. If, and this is a big "if," that comes about, then there is no fault of the believer. It is simply the unintended consequences of choosing to bring more good to the nation, and consequently, to the world. 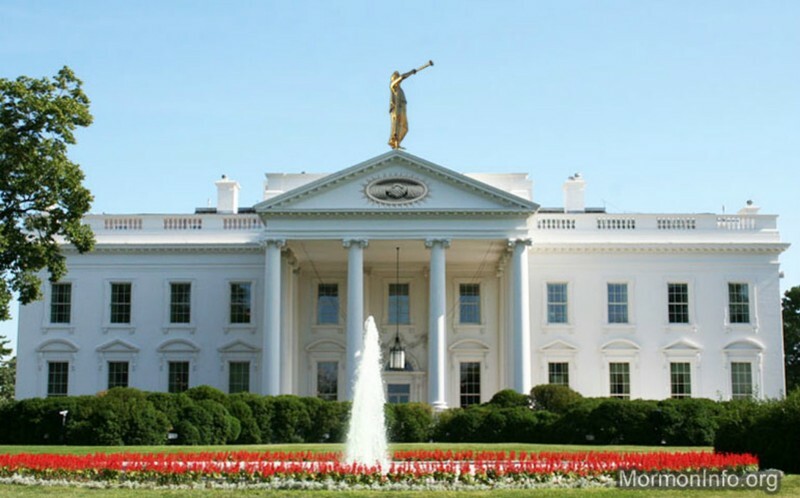 Could the next White House look like this?For more on this issue of Romney and his faith, please see the video that our board member Aaron Shafovaloff put together by clicking HERE. Aaron has also put together a whole web site dedicated to this issue at MittandMormonism.com. There is also a very well done DVD on the history of Mormons and their quest for political power called "A Mormon President." For my review of this film, see here. I am interested to read your own areas of religious concern, if any, that may influence your vote for or against Romney running this country. "What I have trouble believing is that we, as a people, can't see why we are washed out as a nation. We see people like Romney, a church going man, as a threat; that he is unable to help our nation. The atheists' think that a man like that is either lying or easily deceived. What most people fail to take into account is that our nation was built upon God. Even an atheist knows that a church going man is someone who can be trusted; especially when they are Mormon. What most people fail to notice is that their church, The Church of Jesus Christ of Latter Day Saints, is based off of a form of a higher law. I'm not saying they are better than you, or even more intelligent, but they, as a people, show a greater honor and respect as a whole, than most people can claim. If we were basing this election off of the character of the man, then Mitt Romney should win; not because his ideals sound better on paper, or his choices may seem questionable, but because he was raised to be an honest man. Sadly, in this day and age, we can't always tell if a Mormon is actually a Mormon. There are many controversial things out there as to what a Mormon is. Most of it is not true. We do not judge other people; we feel for them. We want to help everything work out. I am a Mormon. Not only am I a Mormon, but I'm a teenager, with raging hormones and a optimist outlook at life as well. Most of you will discard this as garbage, and I'm sure more than a few of you are cursing my name, but i have faith in the Mormon people. I have knowledge of my friends and families; i know I can trust them. Lies and deceit can only take you so far; a true measure of someone’s character needs to be taken from the life as a whole. What you need to know is that Mormons are people to. We make mistakes, we sometimes hide our sins, and we get into trouble just like everybody else. The difference is we try to repent for our mistakes. To make our lives better for our mistakes, not worse. Our nation has let, for no better term, let the crap hit the fan. We are in debt. We are struggling as a nation. This is not one man’s fault; I don't fully blame Obama. But it is our time, as a new generation arises, to make it a better one. To make up for our parents and grandparents mistakes. We will definitely make our own, but as of now, let's not try and throw a bandage over a gun wound, with the bullet still inside. Let's begin the painful process of getting the bullet out, before it becomes too late for us to save this wonderful nation. This may sound asinine coming from a young, ignorant youth, but there is a saying I'd like to quote: It’s not only children who grow. Parents do too. "As much as we watch to see what our children do with their lives, they are watching us to see what we do with ours. I can't tell my children to reach for the sun. All I can do is reach for it, myself." ~Joyce Maynard. Prove to me that you can make a difference. Prove to me that you can reach for the sun and leave us the path to do it ourselves. Not all politicians are dirty. If that is the case, then maybe America needs to find new parents to oversee her; America is your child, show her how to grow. "90% of the population, think mormonism is just like any other Christian religion, baptist, methodist etc. If all those Americans knew more about the mormon faith would they be so eager to get behind the GOP candidate? Here are some points on the mormon religion which Joseph Smith founded and basically made up as he went along. After stumbling across your commentary, and you're asking for retorts, I think your article was auspicious but I would like to say a few things. One, I do not think this election in relation to the times we live in is a common-or-garden election. Those who opt for 'spiritual opus over civil duty' should not be penalized for not voting. I am a hardliner when it comes to abortion, Israel, and the other issues such as gay/lesbian rights, notwithstanding, at the end of the day I see in neither case these candidates as worthy for the highest office in the land. I am tempted like many to vote for the lesser of two evils but let me pose this question; "Vote for the lesser of two evils, Why vote for evil at all?" Now you may think the word evil to be rather discordant or not spiritually or politically correct. However, if we look at the malleable gospels pontificated in America today of course evil is a 'bad' word. God remains the same yesterday, today, and forever, and we know He doesn't cotton up to being mocked? We are drawing nearer to the end times, and the world grows darker, and not to mention when have we had a good president, whether Republican or Democrat in the last ten or more elections? George W. Bush, his Father, their interconnection with the One-World Government and or New World Order leaves many of us deliberating and questioning both the Father and the son and who they really believe in?? Romney has been caught numerous times 'waffling' on abortion and other key issues while his new running mate Ryan, supports atheist Any Rand's philosophy, "Atlas Shrugged." In 2008, we trusted and turned over the reins to a Muslim and now a Mormon?? How much more evidence do we need to establish that this country has been slipping for a long time? Christians today don't know the Word of God as they should and this is the era of Laodicea. Please feel free to read Revelation Chapter Three in its integrality. People have the right to work out their own salvation with fear and trembling, and no one has the right to judge his brother or sister in regard to their specific choices. Nevertheless, personally, I think there will be a 'schism' created where a fault line at the polls will separate Christians in 2012. On one, side may be the ones who are already apostates and those waffling in-between. On the other side, the true believer who recognizes evil and either exposes darkness or turns from it? I think it will get easier and easier to call good evil and evil good in the coming days ahead. I see 'spiritual wickedness in high places' unprecedented unlike ever before. Technology and the internet has proliferated in this era as this disease of touting a luke warm ideology/gospel exponentially replaces truth as clearly defined in God's Word? All in all, many of us our moving away from supporting evil and I think when it comes time for the 'mark of the beast', many Christians will once again rationalize and justify that it may be more in their estimation convenient in choosing again, the 'lesser of two evils'? I was a 'praise and worship leader' on staff once upon a time and like many who have exited Christianity, I fully support the views of Frank Viola and George Barna in their book 'Pagan Christianity'. You have the prosperity teachers/preachers buying up all the cable time and burying the true authentic gospel. I don't believe in using the death, burial or resurrection for personal profit, gain, wealth or notoriety. It's more than unconcealed that God is at the very epicenter of shutting down many Churches in America. "If your duped into thinking Obama and Romney are the only choices then you've already been deceived. There are actual Christians on the ballot! A Christian should choose nothing less.